"The most reliable converter in the RV industry." The converter section is easily accessible from the front. 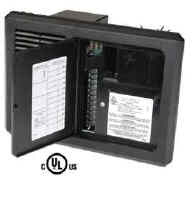 accommodate 30 Amp fuses, ten more with a maximum rating up to 20 Amps each. All wire tail connections. Exclusive hot buss and DC disconnect tie in. Reverse battery blown fuse indicator. EQUALIZATION Mode 14.4 Volts - Every 21 hours for a period of 15 minutes prevents battery stratification & sulfation - the leading cause of battery failure. Weight 5.7 LBS. 6.7 LBS. * Retail and OEM Part Numbers will be determined by your selected options when you place your order.